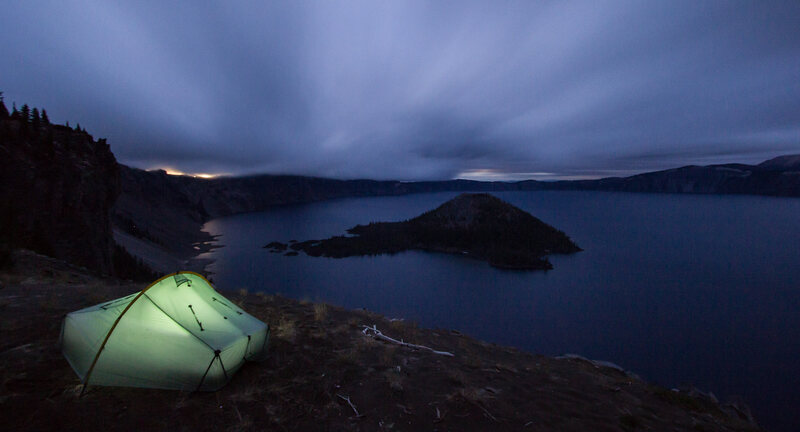 Directions: Crater Lake is in southern Oregon in quite an isolated location. The closest city to Crater Lake is Portland, although it is still a 4 hour drive. Once you reach the park, accessibility to the crater rim is simple, with many lay-bys along the rim road which circles the entire lake. Further, there is a path which runs along the rim edge which is not too strenuous. 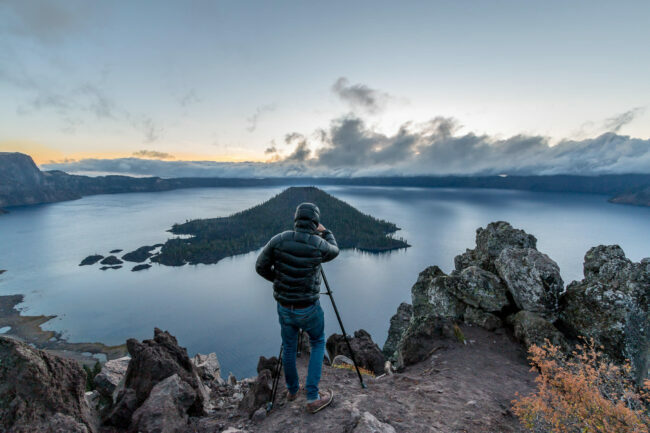 Crater lake is a brilliantly unique location, with the island volcano providing an unmissable focal point for photos. It’s not hard to find an amazing location to photograph along the crater rim, although I found the best angle to be from south western corner, close to the volcanic cone protruding from the lake waters. Walking along the rim trail, there are several rocky outcrops which provide a great clearing from which to capture the entire crater. At a height of over 2000m, the night time and morning air was below freezing late in September. The weather did cloud over late in the evening however, providing some welcome warmth for my night in the tent. The more elevation the better with photography here, looking down on the lake from a greater height makes for a more complete perspective of the lake and volcano. Photos are best as wide-angle as possible. Although it can be difficult to get the entire lake in the shot, using rocks in the foreground helps to complete the crater shape-look in a photo. Try to get everything as sharp as possible here from front to back using fstop f8 or above. I would also advise seeking out some colourful foliage in autumn time to add foreground interest, providing a glimpse of the fall colours which seems sparse in what is a predominantly evergreen area. What are my chances of photographing milky way on a nearly-full moon night (Sept. 15, 2016) from Crater Lake-small window of opportunity between sunset and moonrise? And would a full moon make good photography opportunities (i.e. reflection of the moon in the lake?). I am also going to be in Mt. Hood on the 14th and Klamath Falls on the 16th. Then on to the coast for three nights. Any and all suggestions will be highly welcome! On September 15, the moon will be out before sunset and set shortly before sunrise (dawn) so there isn’t a window of moonless sky. I would imagine that a nearly full moon would offer good moonscape possibilities, and star trails should be possible. You can figure this out by googling moon rise and set tables for nearby towns, by the way. I’m working this month in Klamath and will actually be going to try to shoot Crater Lake the night of the 14th! Btw, you should also check out Toketee falls, which is not far from Crater Lake. It’s quite epic! Good luck w/ your photos! The closest large city is Portland. There are still plenty of other cities closer like Eugene, Roseburg, Medford, and Klamath Falls. The highway between Roseburg and Crater Lake also offers beautiful waterfalls. Portland isn’t the only city in Oregon! Garfield Peak offers GREAT views of the lake. It’s a must do hike! Please do fixate so much on the whole of the crater and miss out on the fascinating details in parts and pieces. The iridescent blue of the water, contrasted with the brilliant white of the tour boats, the kids in summer jumping wildly into the cool water at the end of the only accessible trail down to the shore. The up-close view of wizard island and it’s underwater base seen through the crystal clear water. The up close jagged edges of Ship Rock. The sun shimmering off a protected cove of water. The sprawling branches of Pine, fir and hemlock jutting out from ramrod straight sentries growing in the arid cliffs. So much to see and capture with a longer lens! See my Pinterest page “meorban” for inspiration.